Landon is in warrior mode right now. 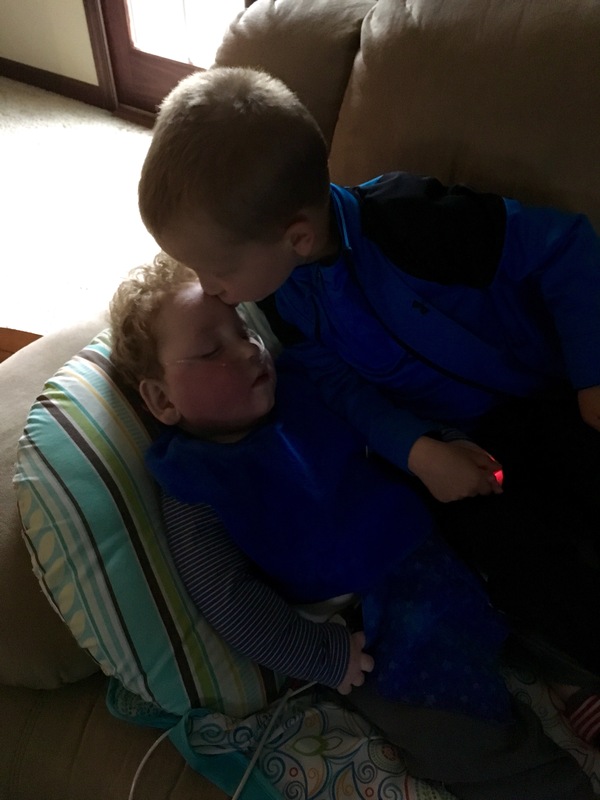 We’re not sure what exactly kicked it off, but subclinical seizures, autonomic dysfunction, a few clinical seizures, and a sudden shift to not being able to manage his saliva have gotten him down. He’s been vomiting, choking, and is on around 2L of O2. We can play chicken or egg all day and never figure that out, so instead we’re focusing on what we can do to make a helpful impact. He’s starting an antibiotic and steroid, and we’re increasing treatments to every four hours. (Coffee please!) We’ll stay the course and hope we see improvements the next 3 days, and hopefully avoid a serious aspiration event in the meantime. He came through one of these episodes with at home treatments in February, and we’re hopeful for the same result. D took fantastic care of him today, and I have the torch starting now. If we can see him turn a corner without needing 3L of O2, we can likely get through this at home. I am also bringing this up, because I want to tell you a story. Of a little boy who is 5, and after God’s own heart. Thanks to a new afternoon nap schedule at his day care, big brother has been full of energy – even between the hours of 9:00 pm and 6:00 am. (Pour me another coffee please!) I was sleeping off and on, but never deeply because I needed to listen for Landon. Loudly over the video monitor, I heard early signs that another choking/coughing spell was on its way. So at 4:00 am this morning I hit the ground running. As I was running through the kitchen I ran smack in to big brother. I kept moving quickly toward the twins’ room, and before I could ask him what he was doing, he said “I was coming to make sure you heard!” He stayed by my side as I rolled Landon to his side, I suctioned, and I tried to keep his airway clear as he continued to struggle. I asked big brother to go get daddy because mommy needed help with this one, and off he ran. Things calmed down, everyone settled in, and it took some convincing to get big brother back in bed, rather than keeping watch, which he offered to do. Horrible sleep habits aside, I am sad that he knows this is urgent, this is important, and that we need to protect the twins. But I am also incredibly proud, grateful, and in awe that even at the age of 5, he gets that this is urgent, this is important, and we need to protect the twins. There are circumstances that I wish were different for his sake, but I remain thankful for what he is learning. A self-lessness, the heart of a caregiver, and a compassion that is hard to come by naturally. I don’t know where he is headed in life, or what his path will be, but I’m excited to watch it unfold. For he, too, is in warrior mode. Prayers for Landon, and prayers for strength for everyone else and feelings of thankfulness for awesome big brothers. Such a heart warming story, big brothers are awesome. Prayers for sweet Landon and parents. I know with how those sleepless nights can be but God gives us strength in our time of need. Hope Landon feels better soon and mom gets rest as well. Prayers coming for all of u guys! Prayers for God to give u the strength to stay strong for all the wonderful guys in ur life hun!!!!! God Bless all of you. Lifting you up with prayers. I have prayed for your family many, many times. You always have been a strong person and you still are!!! Praying now for Landon and his team of warriors!! Thoughts and prayers for all of the warriors in your house, Melody! God bless you and keep you. May God make His face to shine upon you and your family and give you peace as you trust in Him. You are not alone. We’re praying for you, and God has assigned angels to watch over your every stumble. Prayers and love to all!! Praying this is just a minor “bump” for Landon – and your family. Kudos to Karson. Kids are very resilient. He is putting into action the love and compassion he has seen modeled for him and his brothers. Hoping your coffee is STRONG! Landon is a strong little trouper! He has proven this in the past and we know he still is a strong fighter. I agree with Sheila, Karson is putting into action the example he sees in his loving Mom and Dad. Both of you are excellent examples. We pray for strength for the whole family. Keep that coffee pot FULL.